“among the most interesting and underrated bands making music right now...beautiful, and not to be overlooked” - Exclaim! This past year has been an important one for Bernice, the diverse collective of Toronto based musicians. Their debut LP on Arts & Crafts, Puff LP : In the air without a shape was nominated for the Polaris Music Prize and the band just returned from a national tour supporting the record. Outside of Bernice, the band members are active in an array of other multi-faceted projects including their duties as active members of Bahamas, Owen Pallett, Leif Vollebekk, and DIANA. Lead vocalist Robin Dann lent a hand to electronic producer Ryan Hemsworth and ambient jazz composer Joseph Shabason, while keyboardist Thom Gill contributed to new releases from Chaka Khan and a forthcoming album from The Mountain Goats. Gill and Dann, together with collective members Felicity Williams (vocals), Phil Melanson (percussion), and Dan Fortin (bass), have also backed other performers as a whole including Martha Wainwright and Devon Sproule. This week, the collective has paired with The Toronto Dance Theatre for Persefony Songs, a performance that riffs on images from Christopher House's acclaimed choreography Persephone’s Lunch (2001). Scored by Gill, the stage is set with a cast of twelve dancers and the six musicians of Bernice, which has already been called one the 10 Best Stage Shows To See In March 2019 by NOW Magazine. 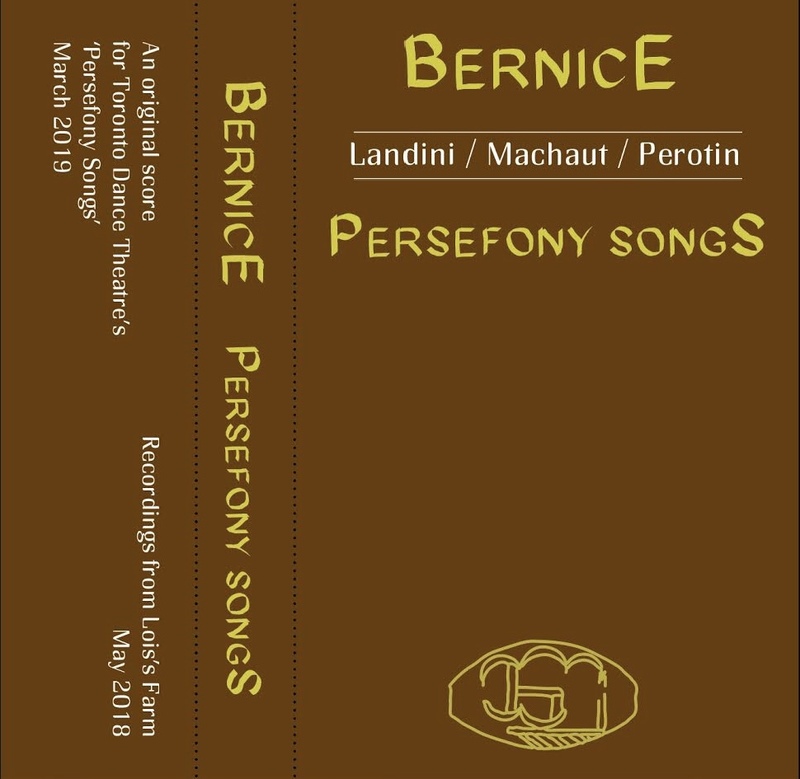 If you’re curious about the score to Persefony Songs, “ambientmozza” is available to stream today and the original score of demos can be found on a cassette for purchase in the lobby. The show runs March 5-9, more information is available at https://tdt.org/persefonysongs. Recently, Bernice also stopped by The Strombo Show for a session that included a performance of the new track “Lone Swan” and a cover of Shawn Colvin’s “Steady On”. The songs premiered this past weekend and can be heard here. They chose a song by Shaiquan, age 9, in care at the children's hospital of Wisconsin. His story is called “Leonardo (And What He Wants For Christmas)”. Formed in 2010, the band’s first release, What Was That, landed in 2011 and saw critical praise from Exclaim Magazine and Globe & Mail. Bernice performed shows with Colin Stetson and supported Tegan & Sara on tour. In 2016, the band returned from a residency at the Banff Centre, and supported the release of two singles, “St Lucia” and “Don't Wanna Be European”, with a series of performances at the Art Gallery of Ontario. Bernice started 2017 by supporting Martha Wainwright on tour across the UK before returning home where Dann wrote a bespoke composition for choreographer Ame Henderson’s production of Toronto Dance Theatre’s NOISY. The band was then invited to Miami to support Angel Olsen for Red Bull Sound Select’s 3 Days In Miami festival. Puff, a 5-song EP, was released in June ‘17 to resounding critical acclaim from Pitchfork, NPR, Zane Lowe, and The Fader. Stereogum and Exclaim named the release as one of the 'Best EPs of 2017. Puff was produced by Grammy Award-winner Shawn Everett (Alabama Shakes, Lucius) and Matt Smith (Owen Pallett). The release was supported on tours with Charlotte Day Wilson and The Weather Station. Today, Bernice return with the serene, dreamlike video for album track “Passenger Plane” along with the announcement of new North American tour dates. Directed by Ayisha Gariba, the new visual, featuring Alpacas, citrus, bubbles, and lush Canadian greenery, perfectly bottles the phantasmal and carefree atmosphere of the song. "We didn't really have much planned before we started shooting, and although that is usually the recipe for a chaotic shoot, this was the exact opposite. I think everyone wanted the shoot to have a relaxing vibe and it did,” Ayisha Gariba says. “In terms of the vision, all that I really wanted to achieve was a video that was a little weird and so pretty that people would kind of forget how weird it was. I wanted to make sure that no one (including me) was ever taking anything too seriously during the process of making it, and I hope that no one takes it too seriously while watching it either. I just want people to get lost in this magical place with alpacas and bubbles for a few minutes," they continue. "What could be better than a day with Shelley and her Alpacas?” rhetorically asks Bernice principal singer/songwriter Robin Dann. “She and her love for her long necked and deeply dopey herd were very, very sweet to behold and a perfect setting for a song about the city at night, old heartache resurfacing, and feeling like a speck in the universe. Ayisha brought bubbles and that helped too."